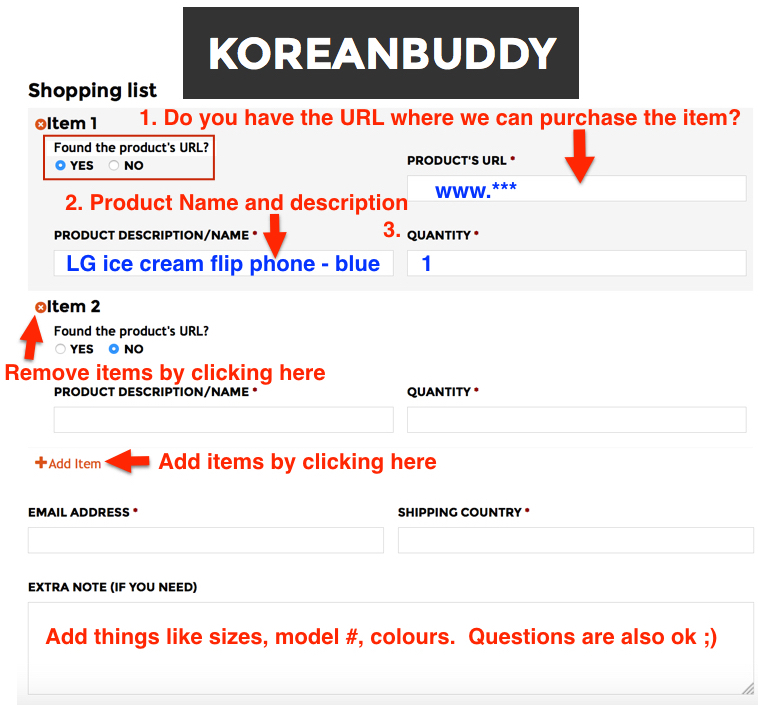 In this guide I am going to show you exactly how to find specific items, decide on product options and the get the required information to order off of Aritaum (아리따움) using KoreanBuddy. 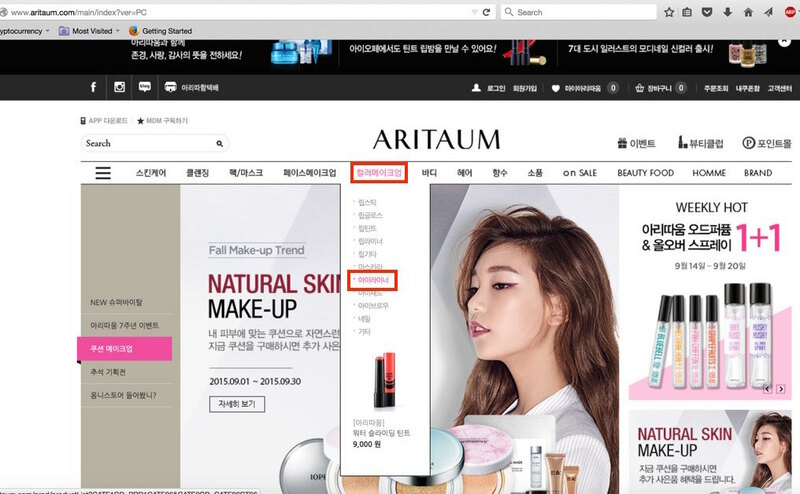 Aritaum is a part of a group of brands under the Amore Pacific umbrella that have stores everywhere in Korea. The brands include: IOPE, Laneige, Mamonde, Hanyul, Ryo, Happy Bath and a couple others. Tip#1 – always be sure you know what you are buying. The product categories on this site are not that great so even though I search for oil based cleansers many products listed in that category don’t belong there. Check the English product descriptions on the product page to make sure it is what you want. Aritaum does not have an English version site, so I want to show you how to use the Korean version. All the product descriptions are in Korean as well so make use of the cosmetics glossary I made. The site is a bit of a joke because they have the “Aritaum Best” products on the homepage, but every time you refresh the page the “best” products change, they are just trying to sell more products. Also, they have a like button “thumbs up” that shows how many people like the products, but you also can’t trust this because one person can click like 1000 times. I up voted the eyeliner to from 70 likes to 2500 likes as a demonstration 2 days ago and they didn’t correct it. ha ha. My suggestion is pick a category from the main menu and just browse around. 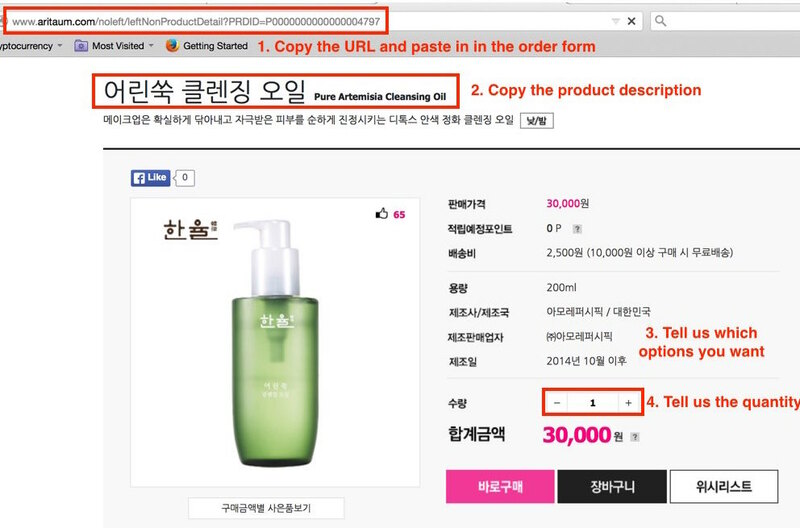 If you find a product you want, follow the standard steps 1. copy the URL and paste it into the order forms on KoreanBuddy 2. copy and paste the product name. 3. Tell us the options you want like color and size. 4. Enter the quantity. If you have a picture of the product you want, but cannot find it, just upload the picture on our site and we will find the best price for you. Let’s search for eyeliner and an oil based cleanser. 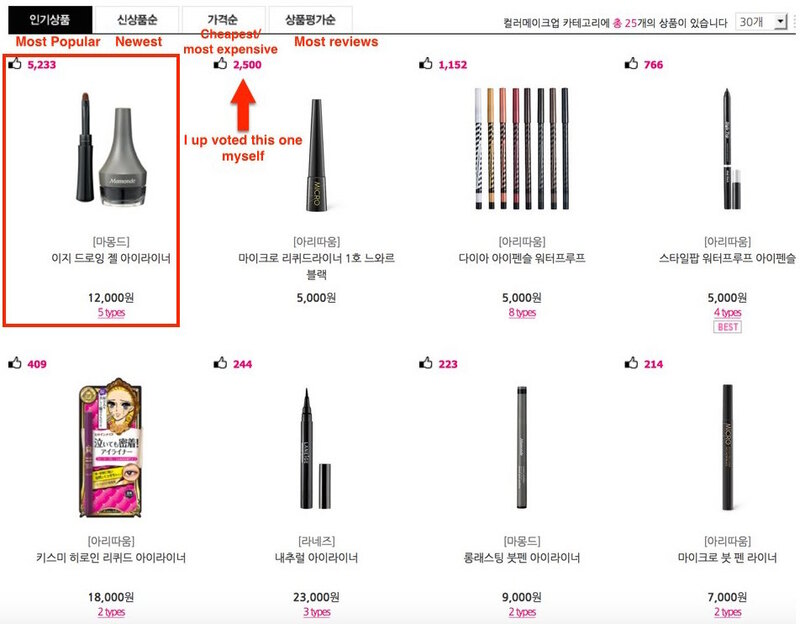 Product #1: Eyeliner – Under the color makeup “컬러매이크업” category I clicked eyeliners “아이라인어” Shown in the picture below. There are many options and you see in 2nd place is the one I upvoted to 2500 likes. 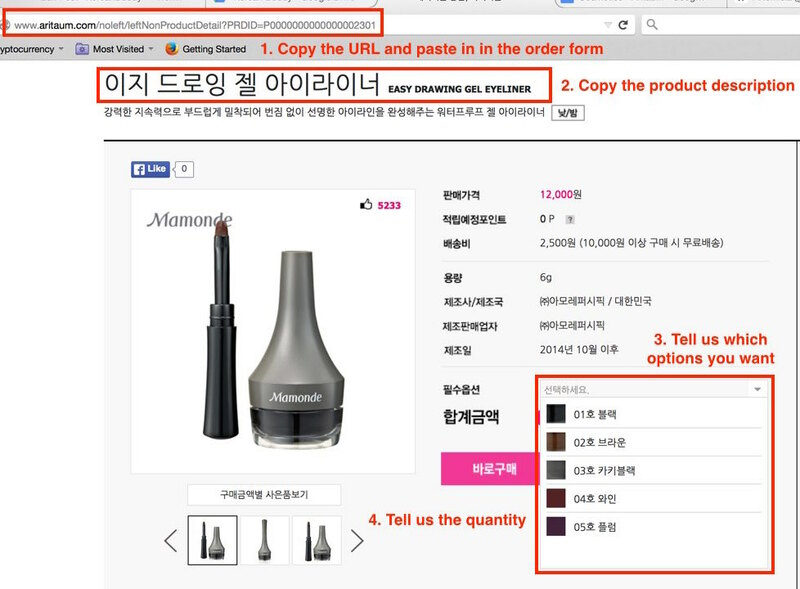 I’m going to select the top item, easy drawing gel eyeliner by Mamonde, it comes in 5 different shades. I did a search for this product on some other sites, here it is 12,000 won and I found it for 9,800 won including delivery. As you can see below, the product name is written in smaller characters next to the Korean product description. You can see the colors in the product options menu which is nice and if you scroll down a little you can see the colors more clearly. To order this product 1. copy the URL and paste it into the order forms on KoreanBuddy 2. copy and paste the product name. 3. Tell us the options you want like color and size. 4. Enter the quantity. At the bottom there are customer reviews. This product just has one negative review, it says “The product seems to be good, but the delivery took almost a week. If the product is out of stock I with you would post that so we can know.” If you would like a review translated just message me in the chat and I will help you out quickly. 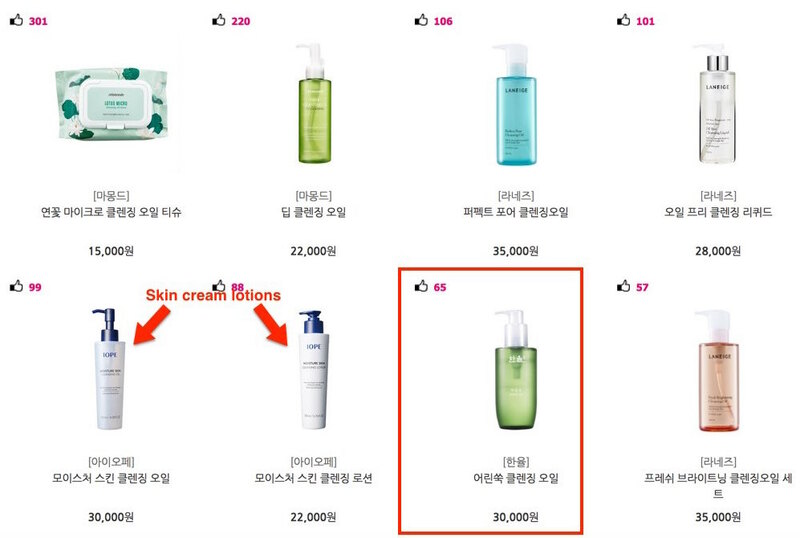 Product #2: Oil Based Cleanser – Start by finding cleansing “클렌징” in the main menu and click cleansing cream/oil “클렌징크림/오일.” Now we can see these brands are more expensive than the Faceshop. Also, remember tip#1, some of these are not oil based cleansers. I’m going to choose the Korean brand Hanyul pure artemisia cleansing oil. Artemisia are a group of plants that have essential oils that are good for the skin. To order this product 1. copy the URL and paste it into the order forms on KoreanBuddy 2. copy and paste the product name. 3. Tell us the options you want like color and size. 4. Enter the quantity. This product is listed for 30,000 won, I also did a search for this product and found it for just over 22,000 won delivery included. If you have any questions about this site or any other just send me a message over chat and I will get back to you quickly.